Will Ilia II reconcile Georgia and Russia? Patriarch of All Georgia Ilia II is the first for a long time official person of the country who is going to visit Russian capital. Patriarch arrives in Moscow at the award ceremony. Ilia II will be awarded the prize "for his outstanding contribution to strengthening the unity of Orthodox peoples". Celebrations have been organized by the International Fund of Orthodox Christians. Visit of the head of the Georgian Orthodox Church will be held at the invitation of the Patriarch of Moscow and All Russia Kirill. About a year ago, Ilia II also visited Moscow. He took part in the 65th anniversary of the Patriarch of All Russia Kirill. Ilia II made a solemn service at Moscow's Cathedral of St. George. At a meeting with Patriarch Kirill they discussed the need to normalize relations between the two countries. During the visit to Moscow Ilia II met not only with the clergy. Dmitry Medvedev, the then President of Russia, took the spiritual leaders of the Orthodox states. Patriarch of All Georgia was among them. In Georgia, the attitude to the visit of the Patriarch to Russia was ambiguous. Some politicians believe that the Kremlin is trying to find a reliable force in Georgia. "The Russian government is trying to return Georgia to its orbit; and Ilia II wants the same", says a theologian Basil Kobakhidze. And the expert Nodar Ladaria called the visit "a great folly and inappropriate action". Today the situation has changed. The new leadership of Georgia has announced the intention to normalize relations with Russia. Patriarch Ilia II, having a good relationship with the head of the Russian Orthodox Church and enjoying great prestige among Georgian population, can play a positive role in this process. One should not also forget that the Patriarch has very good relationship with the current Prime Minister of Georgia Bidzina Ivanishvili. "Visit of the Patriarch of All Georgia to Russia is a very important fact", political expert Giorgi Khutsishvili said in an interview to GTimes. "When there were no contacts between Georgia and Russia, the Patriarch has played an important role in restoring relations between the Churches of the two countries. This had a definite influence on the political part of the question, since it has somewhat calmed tensions. Today, when Georgia is taking the initiative to normalize relations with Russia, the role of the Patriarch in the process increases dramatically. I think this visit may have some political consequences, in particular, to create a general background for negotiations and progress in bilateral relations", said Khutsishvili. But expert of the Center for Strategic Studies of Georgia Kakha Gogolashvili considers premature to speak of the possibility of progress in Russian-Georgian relations. "I do not think that the visit of Patriarch can lead to normalization of bilateral relations. Russian leadership is unlikely to somehow change attitude to Georgia after this visit", Gogolashvili said in an interview to GTimes. "This just might remind the people of Russia, many of whom have little information about Georgia, that we are the people of the same faith, we have common traditions; but I cannot say that the Patriarch can fulfill a political role. So this visit can only improve the general background, but cannot address specific political issues", said Gogolashvili. According to the latest social researchs by the National Democratic Institute, USA, Georgian Church and Patriarch Ilia II are at the first place in popularity compared to other institutions of the country. The authority of the Patriarch both within Georgia and abroad can play a key role in the Georgian-Russian relations, the expert on political issues Soso Tsiskarishvili believes. "By itself, the figure of the Catholicos Patriarch of Georgia, who has great authority both in Georgia and throughout the Orthodox world, in this case, is a strong argument for improving relations with any Orthodox country", Tsiskarishvili said in an interview to GTimes. "I hope that in this case Russia is no exception. Georgian Patriarch enjoys great esteem by the Russian leadership. At the same time, I want to draw your attention to the fact that Ilia II has decided not to wait for the visit of the Patriarch of Russia to Georgia, who is younger and holds his ecclesiastical rank for the shorter period of time, and, breaking the tradition of the church, he has decided to go to Russia. This shows that some religious dogmas can be revised when their aim is higher than just religious relationships. This visit is of great political importance. Given the current situation, its value even increases", said Tsiskarishvili. It is unknown whether Ilia II will meet with the leadership of the Russian Federation. 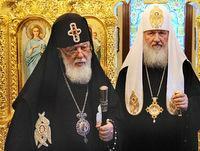 Patriarch will stay in Moscow for a few days.